Many of Barye's best works are the big cats he created in both sculpture and painting. This model of a Panther with a Muntjac Deer is one of his later works, done in the 1870s before he died. The Panther is resting after his kill and Barye used the step of the base to add height and interest to this composition. 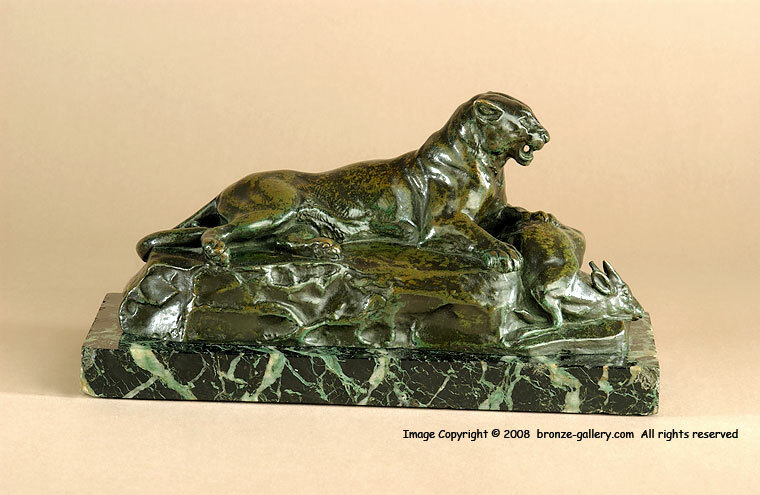 Barye's later sculptures were cast in smaller numbers than his earlier works and the model of the Panther and Muntjac Deer rarely comes on the market. 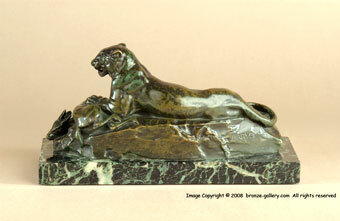 The bronze has a rich dark brown, green and black patina and it is mounted on the original dark green veined marble base. This model is illustrated in Payne's book Animals in Bronze on page 149.